There are plenty of chic trends for the taking this season—from tie-dye to Tevas, hair clips to all-beige-everything outfits. But there’s one trend we simply can’t seem to take our eyes off of every time we spot it on Instagram. We’re talking leather. And not just your regular staple moto leather jacket you have hanging in your closet. We’re focusing in on beautiful leather separates. From leather shirts and blouses to cropped wide-leg pants, billowy-sleeved dresses, and long trench coats, the luxurious fabric is on the limbs of every cool girl worth her salt these days—and we can’t get enough. Black leather remains a popular mainstay, but it’s earthy tones like tan, camel, olive, beige, and cream that are emerging with full force this season. Try tonal dressing in leather separates or throw out the rule book and mix black and brown leather pieces, as seen on some of our favorite fashion muses. While real leather can be pricey, there are plenty of high-quality faux-leather and vegan leather options (we love Nanushka) that feel just as soft and luxurious as the real thing. Whether you go for real or faux, the trend makes every outfit look more expensive—adding a lush and luxurious touch to your look. 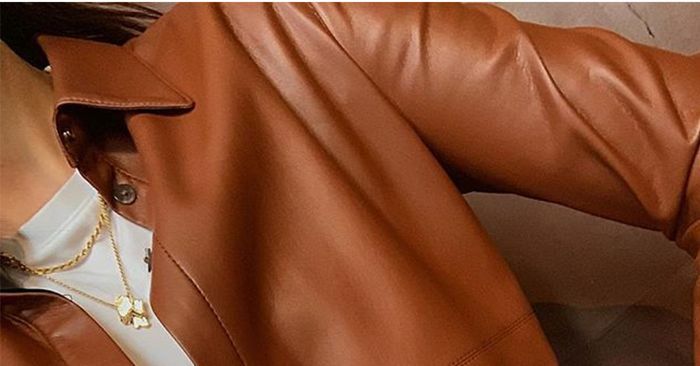 Scroll below to see how the style set is wearing the trend and shop the coolest must-have leather pieces on the market right now.